Dani B - Oh gosh! AMAZING images! Just amazing. I love how Dad is lifting the big sister closer to baby. hehe, so cute. These are all so amazing, oh hang on I said that already, but truly – they are! Wonderful job. Tania - Ooh! I have been waiting for these to be up. They are exquisite. I too, love the last shot. Nat looks so proud of her man and her baby! Love the fluff. You don’t realise how tiny she really is until you look at the shots with mum and dad’s hands cupping her tiny head! Great work again Nicole. Kristen Cook - Such beautiful family portraits of such a lovely family, and how special to have them return again. So lovely! Chrissy Torney - Beautful. Your clean processing is gorgeous as always. Susan Wall - What a curly little one. She is so sweet. Jennifer Stocks - these are stunning. you are such a master of newborns!! 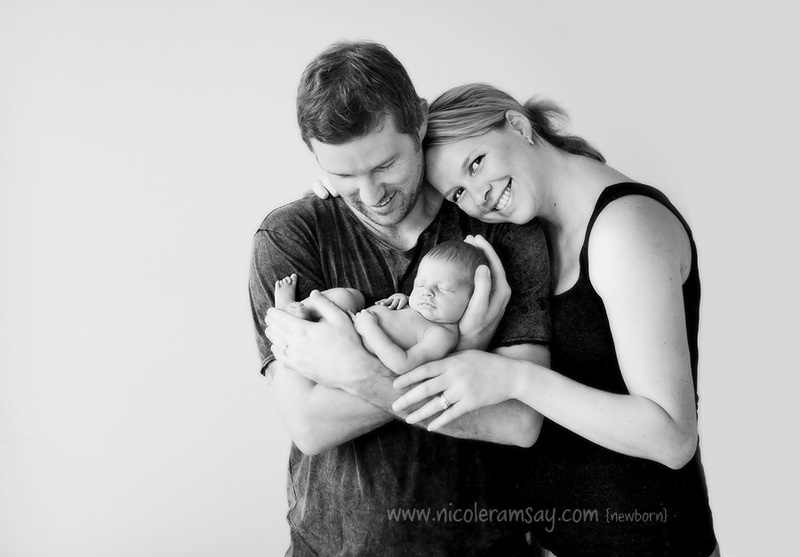 Simone - One of my favourite sessions from you ever my friend – what a beautiful little family and the image with baby Elyse smiling is to die for!!! Hayley - Oh for goodness sakes!!! Reading Nic’s words and then looking at those photos – especially the first and last ones have sent me into tears!! Beautiful beautiful BEAUTIFUL family. You all look so happy and not even an ounce sleep-deprived (don’t know if that last point is a trick of the camera or not LOL).